I had an art history exam this morning and I just receieved my LM package of any 12 sachet powders yesterday. I didn't have Crown of Success at hand so I ended up using Fast Luck powder and Special Oil. #20 on a purple 4" candle before I left for class. The exam was so easy and I was the first one finished! I'm pretty sure I got an "A". Love LM products! Re: Fast Luck is Amazing! Glad to hear your success! Ah-ha! Another great success from the combo of Special Oil #20 and a Purple Candle! I hear you on that! Special Oil #20 is a great oil for a multitude of purposes! I love mine...and purple candles are some of my best friends! Success!!! Thank you for sharing your recipe of adding some Fast Luck Powder to the candle! Great advice. Thanks for your testimonial. Fast Luck really is great. Besides smelling great, it also works! I've won two prizes via online contests and let me tell you, I never, EVER win anything! Highly recommend! Fast Luck is GREAT to rub on your hands whenever you feel like your luck is down OR you want Lucky in a hurry!!! I made a body powder of Look Me Over, Bewitching and Fast luck powders. I also added some glitter and Queen Elizabeth root. But my Fast Luck powder was almost gone so I didn’t have equal parts of Look Me Over, Bewitching and Fast Luck powder. Will that be a problem? It's Facebook Fridays! for August 3, 2018, and we are offering you a free collection of powerful hoodoo spell-lore! The Lucky Mojo Curio Company is holding a random drawing to give away 3 copies of "The Black Folder: Personal Communications on the Mastery of Hoodoo," an invaluable grimoire collecting 20 years' worth of hoodoo tricks, divination methods, and folkloric spells from the Lucky Mojo shop's annual Hoodoo Heritage Festivals, written by dozens of professional rootworkers and edited by cat yronwode. 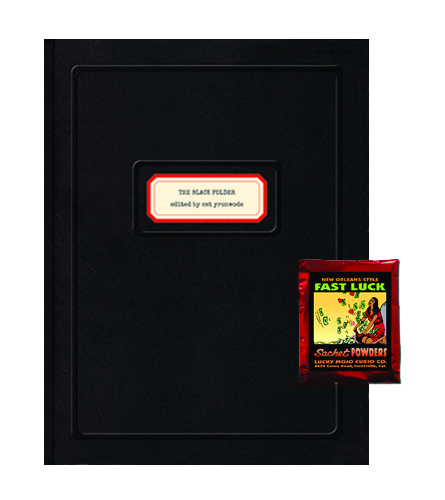 And, along with this community-built "book of shadows," each lucky winner will also receive a packet of hand-made Lucky Mojo brand Fast Luck Sachet Powders to dust your lottery tickets, powder your bed linens, or mix with dirt and sprinkle at your door. First thing tomorrow morning, we will select THREE winners at random, announce their names here, and ask them to message the Lucky Mojo Facebook Page with their mailing addresses, so we can send them their FREE Black Folder and Fast Luck Sachet Powders. So does luck running out and having a string of bad luck considered part of fast luck? I was at a casino today, dusting my hand with a mixture of fast luck, good luck, lady luck, money drawing, and Jupiter powder. I hit a mega jackpot of $160 in a slot machine, then I went nuts and kept on playing, lost about $300. No cash in my wallet at all. So now as I was driving home, I was supposed to be on interstate 95, I decided to get some gas, after finished with gas, I took a turn and went on not interstate 95. Now I am somewhere in Maryland near a toll booth with no cash in my wallet to pay for the toll. Bad luck like this happened to me before, while I was making the mixture, I touched a little bit of powder. Then my phone that I only had for two weeks got stolen, missed a train to New York (from Virginia, which means a few hours for another one), and had to spend some unexpected expenses. All after I touched the powder mixture. I'm thinking about throwing the mixture away and only use them separately. Seem like what I made by combining all those powders made a luck robbing curse mixture. There isn't much left anyway, and I still got plenty in the original packaging. While I have not used the combination of powders that you listed, I have never had a problem blending powders together. I’m not sure if your unlucky circumstances were due to the powder mixture, or if the two times you had bad luck were caused by something else. It sounds to me like your blend did the trick at first. If you do decide to start over, maybe try just one or two powders at a time and see how that works before adding more. I might also recommend anointing your head with clarity oil and your wallet with money stay with me oil before you go into the casino - to make sure you have a clear mind when gambling and the discipline to hold onto your winnings. I know a lot of folks like to carry a Mojo with them while gambling and the Lucky Mojo website has some good ones!! Best of luck to you!! That is what I am going to do in the future. Carry a mojo with me and light some candles. Fast luck does not suddenly cause bad luck. If you ask a friend for a fish does he give you a rock? Of course not. Now your prayer was granted you had fast luck, you won, then you kept going and lost it all and more. This is you need to see when the work is done and walk away with the fast luck you were produced with. Fast luck is not a win all every time, its a quick hit of good luck. You may want to look into a gambling powder or attraction and money drawing to keep it coming. If you are experiencing bad luck, take a spiritual bath before applying the powder. 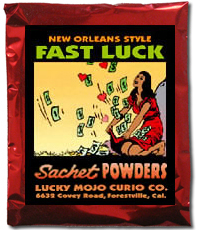 I do have to admit, the Fast Luck powder works.I am saving Fast Luck for when I really need a quick luck. I now ready to start fresh. I ordered a Lucky Hand mojo bag for gambling in casinos in the future and all things done with two hands. Everything isn't always chalked up to luck. It sounds like to me after your streak of luck you got a little excited and didn't know when a win was a win. As a result you started losing money and just became flustered. I would too had I lost that much money. I don't think that was bad luck personally. I agree completely. Fast Luck is like a good surf wave -- you ride it in to shore and you get off the board! RIght on! Happened to me my first time gambling! Well, that too, I did get very excited with that mega jackpot I won. That is what I get for not walking away. Originally I was talking about my bad luck after I left the casino because it seemed like after touching that powder mixture, my string of bad luck was just out of place. I typed that post on Dec 18th in my car on my phone while I had no money to pass a toll booth, in an empty parking lot nearby freezing in below zero temperature. It seemed like all was lost until I drove up to the booth and the lady said just drive past by and they will take a picture of my license plate and mail me the toll to pay later. Then I got into that off road crash, my car wasn't badly damaged thanks to the Safe Travel and Protection powder I dusted my car with. But it did lost its safety bumper and had a turn signal out. I'm ok though, phew. That all happened a few hours after I left the casino. So the mixture is in the trash now and I'll see if I can use fast luck from the original LM packaging as it is.